For breakfast, I make myself two pieces of wheat toast, one topped with strawberry jam and one with a slice of farmers cheese. Then I eat three dried figs. It is silent in my house, when our chocolate children are with their mother. I have lived so long in wildness, from interruption to interruption, that I forget how to do still. There is not enough work to fill the time. Now what? Many are the opportunities these days. My time is given to things I do not ordinarily have the space or the chance for. An Italian dinner night out with my sister. Hosting friends from church. Substitute teaching for my dad. Talking weekly with my mentor. A double date with friends from out of town. Baking whoopie pies. Being pampered with natural products and DIYs with my friend Amy. 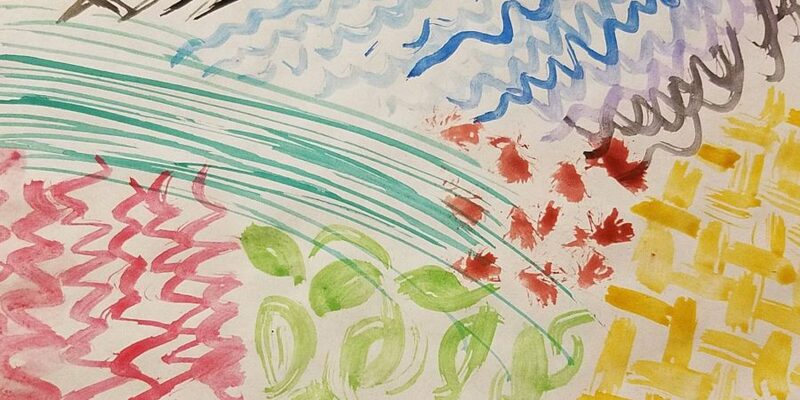 Watercolors with my three-year-old. Brainstorming writing projects. I am such a blessed kid. Last week, bio mom told me she would like us involved in the children’s lives after their return. I got teary on her. She said, I mean you’ve been a big part of their lives, so what kind of a mom would I be if I cut that off? She texted me during their first overnight, asking advice on taking them potty in the night, sending a sweet picture, reporting on what they had for breakfast. By some blessed miracle, we are walking together through this thing. I miss my son terribly. The first hole’s the hardest, and we have dug the twenty-first. He will be home for a visit within days. I plan cookies and outings and chores – I cannot wait. The news from camp has been uniformly encouraging: honeymoon, honeymoon, BUMP. I admit it: we all cheered for the bump. Because now he is real, and can work on things. My precious son. I feel guilty for everything that is easier because he is gone. The silence is palpable, because for the first time in years I do not have to listen for the danger. I am horribly uncomfortable with the silence. There is too much thought in it. I reach desperately for the next challenge, my days arcing and slumping, a fish with a low tolerance for oxygen. It is perfectly possible to write about the sweetness of your marriage and the importance of loving one’s enemies, and then spend an entire day being nasty to your husband. My new goal, set with my mentor, is to learn to sit in silence before the Lord without wincing away. To know him to be present, and good; and to know myself in relation to him. It is so tempting to pick a detour, and to rush on unhealed. This week I felt, for the first time, an edge of anticipation. We have been ferried up, up, up the excruciating climb, full of dread and horror. Now we creep over the edge and hang poised for the plunge, and I do not know where this roller coaster goes. I have no idea what is next. I hang, and feel the hideous weight of the dropping commence, and I think Whooooeeee! for the first time. Here we go, Lord. I am not holding on. I have been talking about me. I would love to hear where God is taking you these days. “Here we go, Lord. I am not holding on.” Wow. Thanks for that little tidbit. For months I’ve been hanging on tightly for dear life…though mine felt like the edge of cliff rather than a roller coaster. I’ve been realizing I think it’s time I let go….in trust. I feel so much here, even though our grief and loss may not look alike at all. The panicked urge to skip the quiet healing process and rush into more activity is eerily familiar. I think I am learning to be a redeemed daughter before I am anything else, and it is both terrifying and delightfully liberating. Maybe this relates to your goal of sitting in silence with the Lord – I’m currently learning/reading about being still enough to get a felt sense of how my body is responding to and teaching me about being in relationship with other humans – I think it could be helpful in growing in relationship with God too. Love you! It makes me so happy to hear about your joys in the suffering. I too am working with mentors to learn to sit in stillness more. Many Many prayers and much love! Thanks, Shari. I find that I’m filling my time with more and more activity these days. Some of it necessary for life. Some of it necessary, I think, for sanity. Some of it, if I’m honest, is so that I can shove down the pain. I watch a lot of basketball, two boys on two different teams, and right now it feels like my soul is sitting on the bench… listening, waiting and worshipping my Coach. It is so tempting to let myself be distracted by so many other things, when really I just need to be quiet before Him. And worship. Praying for you now as you wait. ? I’m late with responding Shari but to answer your question I really believe the Lord wants me to take time to rest in Him. And to trust Him. I worry too much which is something I never used to do. But with concerns for my husband’s heart health ( a-fib) I can’t help but worry. Checking to see how you are doing dear sis in the Lord. Prayers being said for you. Thank you for checking. I haven’t had words for the hard stuff. The Lord is good and I am still going on.